Playing with Lego is a lot of fun. Making up Lego kits is great for L because she has to follow the instructions to get the model right, and sometimes she finds that a little difficult. She loves to display the Lego she has built and play with it. 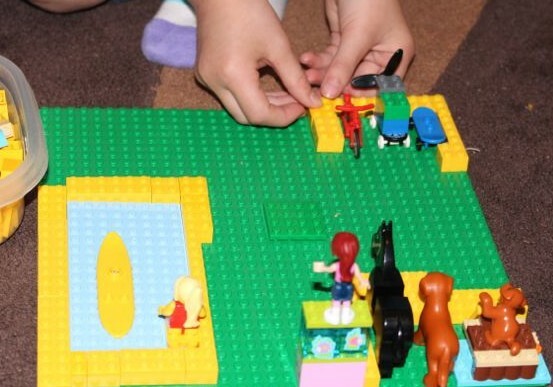 Doing free building with the Lego promotes creativity and logic, as the kids have to design, and then build their creations in a way that works and reflects their ideas. A has only just started to enjoy Lego, until recently she had been exclusively using Duplo, which she loves. Both kids still love building with Duplo, and because of its size I’m not worried about Baby T swallowing it. A placing trees and flowers ready for demolition. 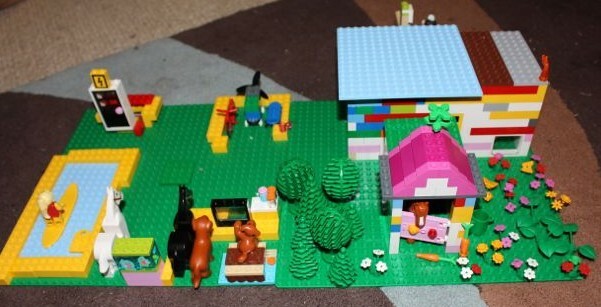 I put out the tub of Lego, gave them each a green base board and asked them to build their ideal school. Between them they decided that L would build the playground, and A would build the school room. A placed trees and flowers on her board first, and then knocked them all down to make room for the school buildings… L’s first addition to the playground was a swimming pool. I helped A set out the base of her building, then she placed windows, a door, and a doggy door (a small opening window). From there she was able to build the walls up. 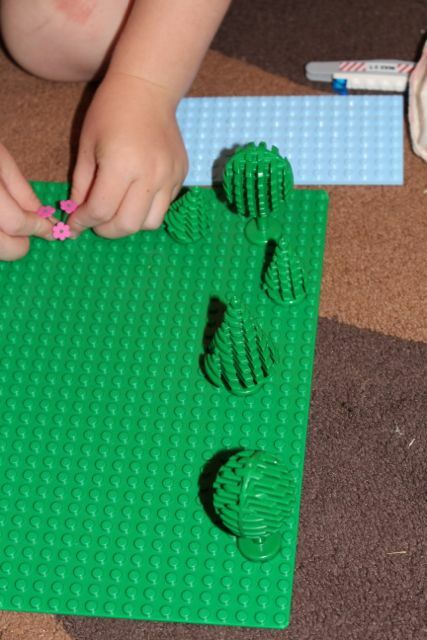 I helped by finding some of the pieces they were looking for, adding some bricks to A’s school room, and putting little flower heads on the flower stalks as requested by A. While we built, we discussed the kind of things their dream schools would have. They both wanted lots of animals at their school. 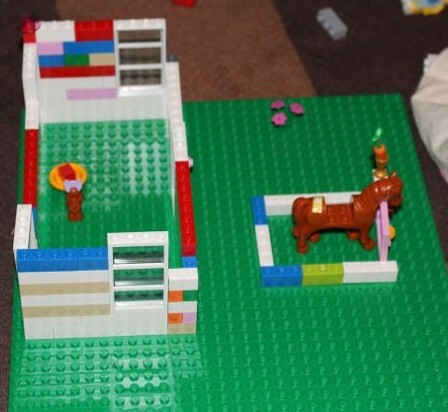 A added a pony and stables to her Lego design, while L added several dogs to the playground. They wanted horses, dogs, bunnies and chickens at their school, as well as lots of trees, flowers and soft grass. A pool was very important to L, and having lots of outdoor equipment like bikes, scooters, hula hoops, climbing frames and a sand pit was desired by them both. They also decided the school should have a nurse with her own little medical area, as well as a swimming instructor by the pool. Building up the school room. This activity fired up their imaginations as they thought about want they wanted at their ideal schools. They are in a small public school at the moment, so they can’t really have all the elements they mentioned, but one thing they both agreed on was that their ideal school would have awesome teachers, just like the ones at their real school. Hearing that made me happy. While they might like to have some extra things, like a pool, at their perfect school, they are extremely happy with their actual school, and the teaches and staff there. They are also very happy to be back at school this year, and are very eager to learn!